How well do you know your margarine history? Let’s take a look at the origins of the butter substitute, and the dairy lobby's attempts to defeat it. Where did the name “margarine” originate? Did Chevreul take his margaric acid and head straight for the toaster? Not quite. If you enjoy margarine, tip your cap to Emperor Napoleon III. Napoleon III saw that both his poorer subjects and his navy would benefit from having easy access to a cheap butter substitute, so he offered a prize for anyone who could create an adequate replacement. Enter French chemist Hippolyte Mège-Mouriès. In 1869, Mège-Mouriès perfected and patented a process for churning beef tallow with milk to create an acceptable butter substitute, thereby winning the Emperor’s prize. So Mège-Mouriès became the first margarine tycoon? Far from it. Despite Napoleon III’s high hopes for Mège-Mouriès’ product, which the scientist had dubbed “oleomargarine,” the market didn’t really take off. In 1871, Mège-Mouriès showed his process to a Dutch company that improved on his methods and helped build an international market for margarine. The Dutch entrepreneurs realized that if margarine were going to become a substitute for butter, it needed to look like butter, so they began dyeing margarine, which is naturally white, a buttery yellow. Mège-Mouriès didn’t get a princely sum for his invention; he actually died a pauper in 1880. The Dutch company that improved upon his recipe did pretty well for itself, though. The company, Jurgens, eventually became a world-renowned maker of margarines and soaps and later became a part of Unilever. 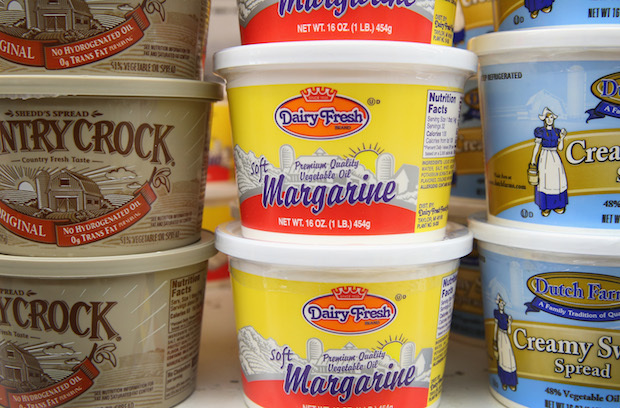 How did the dairy world react to margarine’s sudden popularity? They were predictably more than a little irked. Butter was big business, and the notion that a cheaper substitute, even one made in part with milk, might storm the market terrified dairy farmers. They didn’t take the threat lying down, though, and convinced legislators to tax margarine at a rate of two cents per pound—no small sum in the late 19th century. Dairy farmers also successfully lobbied for restrictions that banned the use of yellow dyes to make margarine look more appetizing. By 1900, artificially colored butter was contraband in 30 U.S. states. Several states took even more extreme measures to turn consumers away from margarine—they required the product to be dyed an unappealing pink color. Did other countries enact similar restrictions? If you think taxes and dyes are tough, then the Canadian government’s anti-margarine campaign seems downright draconian. From 1886 until 1948, Canadian law banned any and all margarine. The only exception to this rule came between 1917 and 1923, when World War I and its aftermath left butter in short supply and the government temporarily gave margarine the thumbs up. Margarine didn’t necessarily have an easier time after the ban was relaxed, either. Quebec’s strong dairy lobby ensured that rules against dyeing remained in place in the province until 2008. Was there any way around these color restrictions? Sure. It sounds almost laughable now, but if you wanted to eat margarine on your toast without having to stare at its natural white color, there was a solution. As the coloring restrictions became widespread around the turn of the 20th century, margarine producers accepted that they couldn’t dye their wares yellow. There was no reason why they couldn’t simultaneously sell consumers margarine and yellow dye, though. When you bought a block or tube of margarine, you also got a packet of food coloring that could be kneaded into the margarine by hand. What helped margarine stay competitive with butter in the face of these restrictions? More restrictions, of course. Paradoxically, the pure foods movement of the 1920s helped undermine natural butter and elevate the status of margarine. In 1923 Congress passed a law that made it illegal to add any other ingredients to butter, even additives that would help make the butter more spreadable. As any toast aficionado knows, margarine is a heck of a lot easier to spread than butter. Suddenly, butter makers couldn’t tweak their products to make it easier to slather on breakfast, but margarine manufacturers could. Margarine’s popularity skyrocketed. Margarine also got a bit bump from World War II. When wartime butter scarcity forced consumers to switch to margarine, lots of margarine holdouts realized that the improved product wasn’t so bad after all. 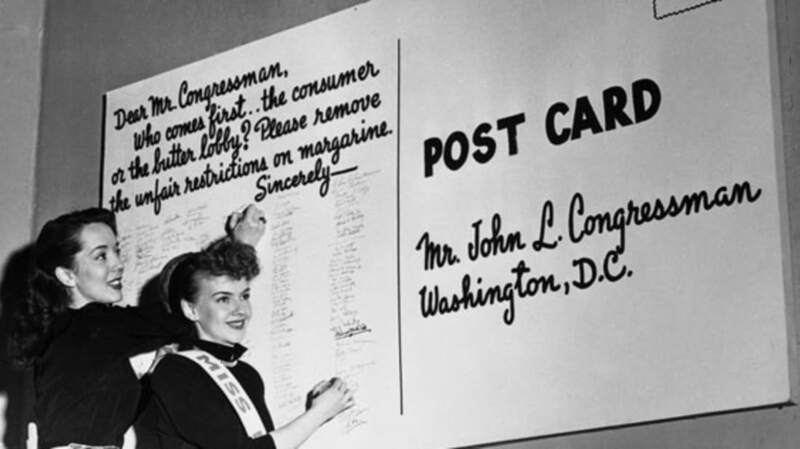 In 1950, the U.S. government repealed the heavy margarine tax, and the market continued to grow as individual states reversed their bans on colored margarine. The last state to repeal the ban on dyes? You guessed it: Wisconsin. America’s Dairyland didn’t allow dyed margarine until 1967.